No more tests for me. I'm done. Last year I was one of the CARA members asking for an Extra Class class. I was really happy when Shawn, N3AE, agreed to teach the class and we started on a three-month class meeting every Tuesday night for three (or more) hours. After the class, after two weeks of taking practice exams online (and failing most), and after reading back through the material that I was having troubles with, I took my exam yesterday. I was nervous. I really wanted to do well as I had invested quite a bit of time and energy into the process of learning this stuff. I also wanted that extra bandwidth to find those sneaky DX operators that hide there. 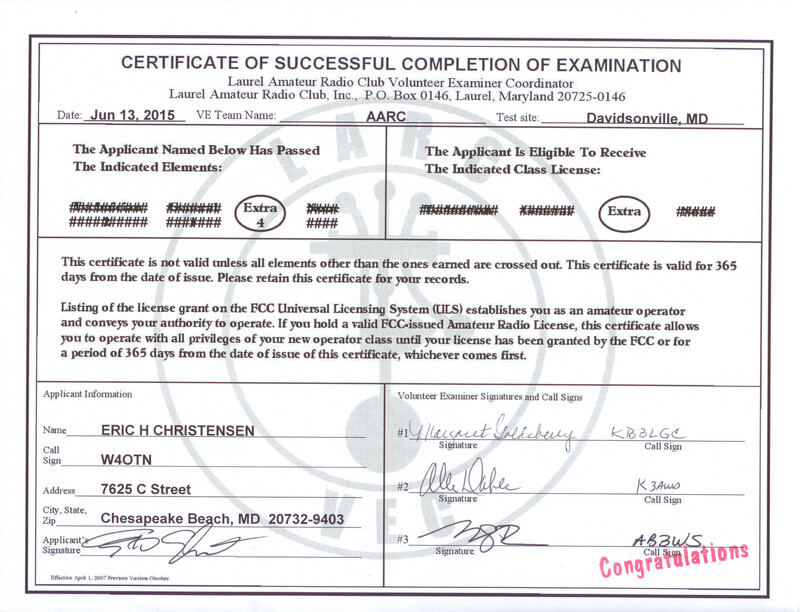 Ed, KC3AEN, with Steve, N3IPN, picked me up on Saturday morning and we made our way to Davidsonville for our test. We had all been in the class and hoped we were ready. We had pre-registered (#s 2, 3, and 4) so we didn't have to wait long to get started. I was pleasantly surprised that most of the questions were familiar and that the others appeared to be ones that I could figure out. 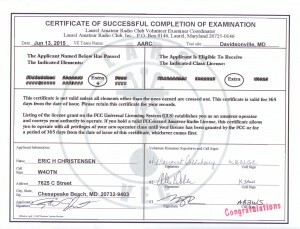 After a couple of hours all three of us walked out with our Extra Class CSCEs! Another gentleman who was in our class, I don't remember his name or callsign, also took his Extra exam and passed. That's 4 for 4 from the class! Add two more that took their tests early and that's about half the class that has passed the exam! Last night I put a couple of QSOs in the log from the Extra and Advanced portions of the bands. I even ended up with a new DXCC entity in the books. Looks like all the studying is already paying off.